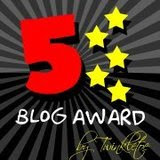 Mommy Cool gave this award and I'm so happy that keeps on visiting my blog always! I'd like to think that I'm a 5-star blogger anyway it's just a thought lol! I like to pass this award to JennyL, Cherry Rose, Lutchi, JennyR, Darlene, Dauph, Tere, Yenny, In-In, Roselle, Nita, Geng and Liza. Hi Race for some reasons I can't leave a msg in your tagboard. Anyway, pls add naman my domain here "Random Thoughts" www.mirasblog.com I've added you already.